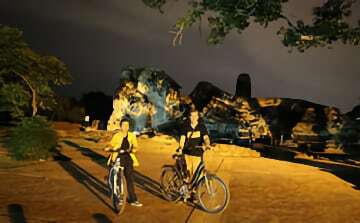 “Ayutthaya City Culture” is a 3-4 hour Ayutthaya bicycle adventure that takes you around Phra Nakhon Si Ayutthaya (Sacred City of Ayutthaya), the Siamese royal capital from 1350 to 1767. Ayutthaya offered a variety of geographical and economic advantages by the gathering of three rivers, the Chao Phraya, the Pasak, and the Lopburi. From a small fortified island-city, the city grew into a powerful kingdom. In its heyday, Thai culture and commerce flourished, and lots of foreign merchants resided in the capital, including Dutch, Portuguese, French, English and Japanese. Around 1700, with a population reaching 1.000.000, Ayutthaya was one of the world’s largest cities at that time. 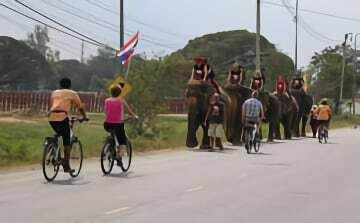 During our Ayutthaya bicycle excursion you will get a good impression of the once mighty capital of Siam. Our first stop is at Pom Phet or “Diamond Fortress”, one of the sixteen fortresses along the city walls of Ayutthaya. Although partially destroyed, the fort still conveys what must have been ancient travelers first impressions of the Kingdom of Siam. We continue our Ayutthaya bicycle adventure and cycle through local neighborhoods and pass so-called “Roti Road”. Dozens of vendors offer bags of the colorful “Roti Sai Mai”, one of the most famous Thai desserts in Ayutthaya – threads of twirled palm sugar wrapped in a round unleavened bread. We cycle through the quiet Somdet Phra Srinakarinda Park to Chedi Phra Si Suriyothai, a memorial for the first heroine in Thai history, and make a short photo stop here. Then we ride further along the river and observe the daily life of the local people living on the river banks. We stop at a Muslim community where they make handicraft woven wind mobiles from palm leaves in the shape of a carp, “Pla Tapian Bai Lan”. The tour brings us then to the world-renowned Ayutthaya Historical Park, an UNESCO World Heritage Site since 1991. Here we see the ruins of the old temples. We stop at Wat Phra Sri Sanphet which was the most important temple of Ayutthaya and situated within the Royal Palace grounds. We continue our Ayutthaya bicycle ride to “Chao Phrom Market” and walk with our bicycle over the market. This busy market has been around since Ayutthaya was the capital of Siam. It houses a large concentration of amulet shops, food stalls and vendors selling all kinds of wares. We take a ferry back to cross the Pasak river and within a few minutes we are back at our office where the tour ends. During the trip we make regular stops for sightseeing and to provide you with drinking water/soft drink and a Thai snack. Anyone able to ride a bicycle can join this Ayutthaya bicycle excursion as it is designed to be enjoyable, educational and fun and is not too demanding on the legs!